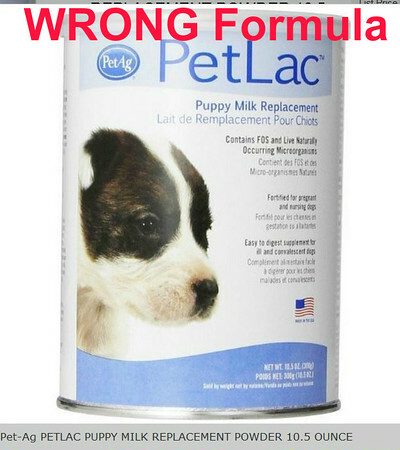 When buying PetAg puppy replacers make sure you are getting the correct one. PetLac sits in the squirrels tummies like cement. They bloat, and can not defecate. This could cause death. Last edited by Nancy in New York; 01-05-2017 at 03:25 PM. little ones that were given Fox Valley 32/40, and it saved their lives. 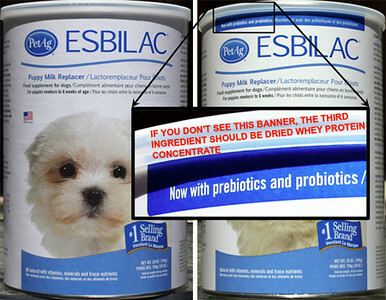 Can anyone opine on liquid Esbilac Puppy Milk Replacer? so we never recommend it. If I'm not mistaken, I think it has something to do with different proteins sources. It is the sodium caseinate that is the issue. The dry powder has both whey protein isolate, which is VERY digestible, AND the caseinate, which is less digestible - which is what allows it to stay in the system longer and thus allow you to go longer between feedings. But in the wee ones, having the easily digested whey protein isolate is the way to go. It may not be as convenient for the human but it is a lot better for the baby. The liquid Esbilac has ONLY the casein, none of the whey protein isolate. So it doesn't digest properly and either sits in the system not going through until it begins to ferment and cause bloat; or the system just rejects it and it shoots through undigested as diarrhea. make sure the third ingredient on the can says dried whey protein. In 2014 these were the ingredients in the 32/40, notice NO dried whey protein. I've wondered for a long time if the problem with FV32/40 is the lack of dried whey protein. Vegetable oil, casein, dried milk protein, dried skimmed milk, dried corn syrup solids, dicalcium carbonate, potassium chloride, magnesium sulfate, L-arginine, D,L-methionine, taurine, sodium chloride, dipotassium phosphate, mono and diglycerides, choline chloride, vitamin E supplement, vitamin A supplement, vitamin D-3 supplement, zinc sulfate, ferrous sulfate, riboflavin supplement, calcium pantothenate, niacin supplement, manganese sulfate, copper sulfate, vitamin B-12 supplement, thiamine hydrochloride, pyridoxine hydrocloride, folic acids, calcium iodate, biotin, sodium selenite, natural and artificial flavors added. I have a bag of Fox Valley 20/50 and the third ingredient says dried whey protein. Last edited by Nancy in New York; 05-16-2018 at 09:56 AM. I am good friends with Nick the owner of Fox Valley. Please call him with your suggestions and comments regarding 32/40. As a small local producer he is always open to improving formulas and welcomes feedback unlike PetAg which is corporate and does not listen to small product users. We all know PMR is usable but far from ideal while 32/40 is formulated for baby squirrels. There was a one time issue with ultra filtered skim whey that was resolved. Admin, please give Nick a call to discuss the 32/40 misinformation and whey protein content so we can resolve this once and for all. Whatever Nick says you can take to the bank. I always start 3/1 after hydration transitioning to 2/1 and make sure my FV is well dissolved before feeding. I use hot water, shake thoroughly, and let it absorb water overnight in the fridge. In the morning I shake again and allow time for the air bubbles to rise before warming and feeding. My formula is being readied in this manner while hydration is taking place. 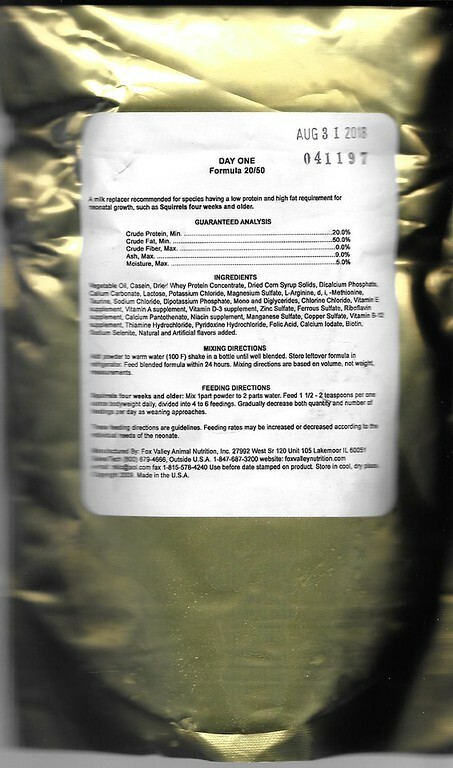 I have confidence in Fox Valley and their excellent product and trust Nick Vlamis for delivering the best product available in the industry using human grade ingredients. OR "this is the first time he's heard of a problem"
Here's a thread addressing the problem when it first happened. Members posted when they called and spoke personally to Nick, to no avail. I'm hearing what you are saying and the goal is to resolve any real or perceived issues with 32/40. I have attached photos 2 current date bags from FV. One is 32/40 and the other is 20/50. Based on the labels what ingredient suggestions would you make to improve 32/40 so it would receive "go-to" recommended status once again? I will personally take the suggestions directly to Nick. Repeatedly he said that nothing changed with his FV 32/40 formula. dried whey protein, I took note. People were having good luck (as always) with the FV 20/50, which also had dried whey protein. years ago, it was our "go to" formula, and then it wasn't. that's why we started suggesting FV 32/40. changed their formula to now contain dried whey protein. they both contain dried whey protein. Hi Farrelli - I get the hottest water straight out of the tap......and even microwave it (1/4 cup water for 15 seconds) if I have to. Then I mix my powder, shake, let it cool for just a second and then add my cream. I have NEVER had an issue with curdling so far. I also try to mix at least an hour before feeding but sometimes that doesn't always happen. Just tell people if they have not purchased a can yet that it HAS to have Dried Whey Protein CONCENTRATE (3rd ingredient on the list on the can). If they buy the old stuff you will be battling the same old issues......diarrhea!!! Last edited by Nancy in New York; 05-16-2018 at 06:37 PM. Nick and I had been so close over the phone for years -- up until the debacle of 32/40 a few years ago -- that at one point HE asked a few other rehabbers to beg me to call HIM. I had stopped doing so, out of frustration and, frankly, anger at his complete unwillingness to see the truth. He did not like the fact that TSB was telling folks not to use 32/40 for pinkies. There is something radically wrong with 32/40 when it comes to pinky squirrels age 1 day - 2 weeks old. I will NEVER feed it to my pinkies again. I still have nightmares about the slow, hideous way my precious pinks died of bloat.....one after another....slowly and painfully. I don't lose pinkies; that's why I am always eager to take them. Nick said "It's the first I've heard of it..." then, "why don't you just dilute the 32/40"........then "we haven't changed a thing". I gave up. No, I did not call him back regardless of who asked me to. they both contained dried whey protein. The photo of the bag or 32/40 clearly shows no whey protein. Perhaps that is the ticket and I will discuss it with Nick. Pinkies have VERY sensitive digestive tracts (as you know) and it's also possible the solids were too heavy in the 32/40 batch that caused problems. Esbilac seems to be a finer powder also that dissolves quicker. I will ask Nick about mirroring the 20/50 ingredients list yet keeping the ratio at 32/40. I know he talked about going to coconut oil. Anyone have thoughts on that? We need to worry more about the traffic that is lost to the scalded milk zealots due to page ranking. I would even be willing to re-task my rescue website and load it with SEO linking it to TSB so people searching for "baby squirrel care" are diverted to the proper information instead of "nut jobs". Hello, I am new here. My sister just got two very young pink and grey baby squirrels. She got 3, but one just died tonight. She told me to buy her the esbilac for her to feed them, but my walmart didnt have it. So I bought her a different one. I will attach pics. Can someone please tell me if this is safe for the babies?? I am devastated to think that my mistake might have killed one of them! Milk Replacer is not Esbilac. It is the wrong formula, does not contain all the type nutrients needed, not digested as well and usually causes diarrhea which in turn dehydrates baby. You said sister "just got" these babies, very unlikely the formula was the cause. That being said, you do need to get the correct formula with the pre and pro biotics. Has she ever raised these babies before this? Does sister have a scale to be weighing these babies? Babies need to be weighed to be fed between 5-7% of their body weight, over feeding can be dangerous. Feeding with too large an instrument can be dangerous. Aspirating formula can be dangerous. I'm attaching a link on baby squirrel care, please ask any concerns you may have and we'll do the best to answer them. Go to this link. It's 6 pages long with the next button on the top right corner.. They were brought to her yesterday evening. She has attempted to raise a couple before that were brought to her by someone where her husband works, but they were both very sick when she got them and didnt make it. We have both done a ton of research, but every site says something different regarding food. Fox valley is the best, no dont ever use that! Esbilac is the best, no its killing babies! Goats milk, no never! We have ordered both of the mixed of the fox valley, waiting on delivery, now I read here that it is bad. We just want to save these babies, but I am so frustrated! We are continuing to rehydrate, and will be getting a scale tomorrow. They aren't taking much at a time of the rehydration fluid. I'm going to copy this reply to your personal forum https://thesquirrelboard.com/forums/...ing-the-babies and answer from there. Please stick with that thread, jumping back and forth gets very confusing when seeking advise. I received two baby boys almost two weeks ago. We have them Pedialyte for the first 12 hours. Then only thing we could find that night was Kitten replacement. They are that for the first day and then we picked up esbilac goats milk replacement. The babies seemed to love it and didn’t have any issues. I continued my research( I have never had babies this little) and decided that I was going to buy fox valley. I have both 32/40 and 20/50. I switched without transitioning to the 32/40 (nervous they were going to get sick on the other formula from my readings) and they seemed to do fine. They have been on it for 5 days now. The past 24-36 hrs I’ve noticed Cory’s belly wasn’t deflating between feedings. Trevor’s seemed fine. They were both using the bathroom fine. The color changed to a golden-yellow. Then yesterday I noticed Cory’s belly was getting slightly more tighter, but only near where his milk band is. He looks fat, but it’s not super tight. Then I noticed his stools were getting firmer. Just now, I noticed the belly of Trevor’s to be a little rounder than normal. I gave .5cc sugar water (I didn’t not have apple juice) to both. Then read some more and decided to switch to water right now I told I can see a difference in their belly’s. Any advice would be much appreciated. I keep reading and reading and the information here between people is a bit conflicting. Rehabbera, halp? I need my babies to be happy and healthy. I will also add that they still have an appetite. I’ve been feeding roughly between every two to 3 hours, sometimes stretching it to 4 a couple times over the past week due to life happening.